other characteristic: The bottlenose dolphin is the most popular dolphin around the world. He's easy trained and learns very fast, that's why it's often seen in dolphinariums. Characteristic is the grey color, which is darker near the fin and brighter at the belly. It's typically that it's very curious and as said the high adaptability. 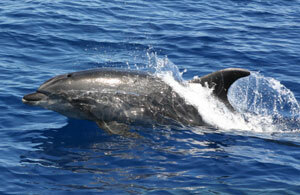 The bottlenose dolphin is in it's occurrence areas very frequently.